This Integrated Sensor Suite includes all the sensors you need to measure solar energy potential or Evapotranspiration. 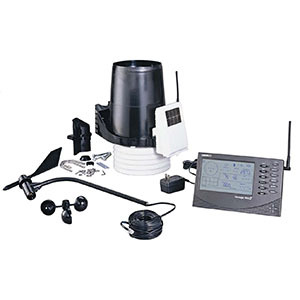 Add a Vantage Pro2 console to create a local station; add a Weather Envoy and WeatherLink data logger to view data on your PC; or add Vantage Connect for a remote station with data communicated via cellular connection. Add cellular-based, solar-powered Vantage Connect to upload your weather data to the Internet. Get real-time alerts for frost, evapotranspiration, high winds or other conditions you specify. Wireless sensor suite with integrated sensors for temperature/humidity, rain and solar irradiance. Includes daytime fan-aspirated radiation shield for greater accuracy. Wireless transmission from the sensor suite to Vantage Connect, a Vantage Pro2 console, or Weather Envoy up to 1,000 ft. (300 m) away.